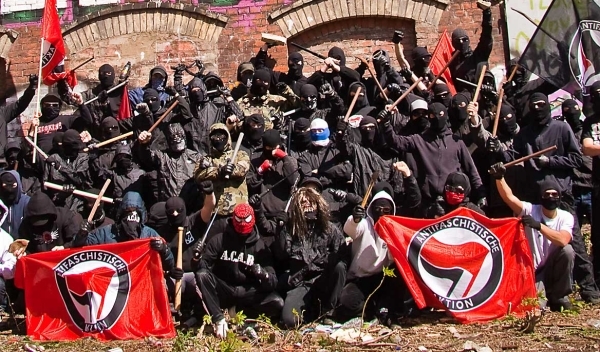 Most 'official' Antifa groups label their movement as Anarcho-communism (also known as anarchist communism, free communism, libertarian communism and communist anarchism). "It is a theory of anarchism which advocates the abolition of the state, capitalism, wage labor and private property (while retaining respect for personal property) and in favor of common ownership of the means of production, direct democracy and a horizontal network of workers' councils with production and consumption based on the guiding principle: "From each according to his ability, to each according to his need". Sounds different than regular Anarchy or Communism, doesn't it? At first glance 'yes'. In his theory of communism, Karl Marx, says communism is supposed to be lived with no state at all, so by technical definition it is true anarchism (a system with no state). The key word is 'in theory'. Remember, Marx also said to have Stateless Communism humanity would either have to evolve first or there would need to be a temporary state to force people into it, and then it would eventually be stateless at some point (which we have never seen happen). In actuality, to accomplish the goals of communism some form of government is needed to maintain it, so something with the power of the state. The Definition of Anarco-Communism says it is a system with no state just like Marx' stateless communism, but like with Marx' communism, in reality you have to have a government to govern the 'common ownership of the means of production'. "From each according to his ability, to each according to his need" is wealth redistribution, which again you need a government to accomplish this system. It claims 'private property' ownership is not allowed, but 'personal property' is allowed. But, how do you hold your right to stay somewhere (a dwelling) unmolested if you can't own private property? How do you not allow private property (housing, automobiles, businesses, means of production, ect)? What if the current owners of private property don't want to give it up? Who makes them give it up? Do you make it happen through 'Direct Democracy' by forcing people to give up private property aka use government to create a law (like a state)? Using 'Direct Democracy' to accomplish all of this is using a government, which does the same thing as a state. 'Direct Democracy' is mob rule, which is worse than 'Representative Democracy', because it (Direct Democracy) is quick, direct and has no barriers for slowing down and/or stopping the hot headed crowd from making decisions that could cause tyranny. Usually the minority suffers under direct democracy. Would Anarco-Communism, which is actually just regular communism need a state at first to accomplish it's intended goals? Yes. So we still would have some form of a state to initially force people to give up their private property and to maintain the system, so not anarchist at all. But no matter how hard they try and attach anarchy (no state) and libertarian to Anarcho-Communism (which is Marx Communism); it just sounds like the 'State Communism' we have always witnessed since its original inception. Communism requires a strong state to force people. Think of the likes of LeBron James and Beyonce. Between them, well over $100M/year. Communism (done "correctly" ... which it never is) would require 99.5% of what they make (or more). They would do what other wealthy people do ... move or cheat (look at the huge wealth in impoverished African nations with 80+% tax rates ... the wealthy find it easier to buy politicians than pay taxes). Hoping Antifa is a fad and that these folks will grow up ... but not terribly optimistic with the way things are going. Glad to NOT live in a major metro area. I agree. The article is basically saying just what you wrote. It is saying that Anarcho-communism is just communism, because they have the same end goals...a stateless system where the means of production are shared and no private property, BUT in order to accomplish this you need a state, So the theory fails.